Robin Williams was an American actor and comedian born in 1951 in Chicago, Illinois. Williams originally became popular for his portrayal of the alien Mork in the TV comedy Mork & Mindy. He also became an established stand-up comedian an film actor as well. Some of his most highly acclaimed work came in movies such as Good Will Hunting, Dead Poets Society, The Fisher King, Awakenings, The Birdcage, and Good Morning, Vietnam. Some of the accolades he earned throughout his career include an Academy Award, two Emmy Awards, two Screen Actors Guilds Awards, four Golden Globe Awards, and five Grammy Awards. Williams was married to Valerie Velardi and had three children. In 2014, Williams died at the age of 63 after being found unconscious at his home in Tiburon, California. I remember pulling up to the Boathouse where we had our party and I’m sitting there with my wife, gathering myself and I look out of the window and I say, what? Is that Robin? Is that his ghost? No! It’s Radioman. And it brought back all of these wonderful feelings of what an amazing time we had together here in New York shooting The Fisher King. And I got out of the car and embraced Radioman, looked in his face. And I remember when we were shooting Fisher King—Radioman, he knows where all the movies are shot somehow, I don’t know how he magically does that. But, I remember seeing Radioman and he could not believe that Robin’s character was here in the flesh in reality. And there he was. And so we embraced Radioman, I felt Robin’s spirit as I’m feeling it here now in this room with us. The idea of having a steady job is appealing. I have two (other) choices: go on the road doing stand-up, or do small, independent movies working almost for scale … My life has downsized, in a good way. I’m selling the ranch up in Napa. I just can’t afford it anymore. Well, not all. Lost enough. Divorce is expensive. 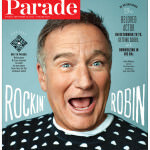 Williams is interviewed by Parade Magazine about his role in CBS’s The Crazy Ones, his first series since Mork and Mindy 30 years earlier. It’s fun. I’m having such a blast doing it with Sarah. She’s a sweet woman. And the idea of a father-daughter relationship—since I have a daughter, I’ve done the research on that. 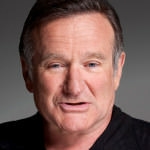 Williams interviews with Dave on the David Letterman show to promote William’s new movie Old Dogs but ended-up cracking jokes about Sarah Palin, the former Governor of Alaska.